With all the talk surrounding The Passion of the Christ, I hoped the movie would live up to the buzz. I like raw, heartfelt, labors of love, and I’m not averse to controversy. Although it contains inspired moments, as a whole, The Passion is a disappointment. The film opens in a dark and foggy forest, just before Jesus (Jim Caviezel, bearing his character’s initials) is captured. He has been in Jerusalem for a week and he’s angered the local Jewish council. They take him in to custody and accuse him of heresy. He did, after all, say that he is the son of God. The next morning, the council takes him to the Roman governor and demands that Jesus be punished. Pilate (Hristo Shopov) would prefer not to get involved in the internal conflicts of the local Jewish community, but their leader Caiaphas (Mattia Sbragia) insists. He reminds Pilate that Jesus also refused to pay tribute to Caesar, which is a Roman crime, not just a Jewish heresy. Pilate agrees to “chastise” Jesus, hoping that will appease Caiaphas. (The chastisement is the bloody flaying you’ve read so much about, but more on that later.) In the end, Caiaphas and his followers demand Roman justice — crucifixion — for Jesus. (Caiaphas’s zeal and Pilate’s reluctance must be what sparked the misguided claims of anti-Semitism.) The rest is history. New versions of well-known stories raise the question “what does this version offer.” In this case, the most obvious answer is the gory bloodbath of Jesus’ “chastisement.” Subtitles disappear in that scene so that you can focus on all the horror, including the flays sticking into Jesus’ side, right in front of the camera, then ripping upward, tearing flesh and spraying blood. The scene brought to mind the image of Mel Gibson painted with blood after a gory ax-fight in The Patriot. It was also hard not to think of a parody trailer that compares The Passion to Quentin Tarantino’s Kill Bill. In fact, there are a lot of action-movie cliches in The Passion; call it Gibson’s signature, his style. The foggy forest is haunted by low rumbling bass and mysteriously staccato pan flutes; the sonic landscape sounds like Predator or Tears of the Sun. The prison guards laugh with the cruel glee of movie-villain henchmen everywhere. Bad guy Caiaphas stands in for the humorless, offended drug kingpin. Gibson even cuts to slow-motion on scenes of action or violence. The Gibson/Tarantino/action-movie style is not in itself a judgement for or against the movie. But it will lead to pros and cons, depending on your take. For example, this approach is very good at showing the high price Jesus paid. 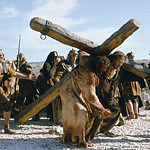 Flaying and crucifixion are inhumanly cruel, as Gibson convincingly shows. It’s a movie Amnesty International could use to raise funds for political prisoners and human rights. Ironically, The Passion is also good at showing the perils of religious fervor. The bad guy, Caiaphas, is the most zealously religious figure in the movie. When the entire audience begs the brutal flaying to stop, Caiaphas demands more punishment for this man whose worst crime is heresy. And although the movie doesn’t show it, we know Caiaphas’ punishment ultimately backfires, his victim becoming one of the most influential figures in history. This approach has drawbacks, too. For one thing, turning a religious story into an action movie is a little distasteful. For another, the plot can’t keep up with the conventions of film. Jesus’ overlong trek to Calvary doesn’t live up to the chase-scene music or the swelling strings as Jesus picks himself up, in slow motion, from the ground. Perhaps the hardest criticism to overlook is that this movie treats Jesus as a prop. The personality of the man never has a chance to come through. Caviezel is a talented actor, but he spends so much screen time in a semiconscious state, and under so much gore and blood, that it’s impossible for him to emote. Flashback scenes show a calm, peaceful Jesus with his disciples, but these flashbacks are too short to round out the character. Then again, perhaps Gibson and Caviezel deliberately tried to leave Jesus as a blank, allowing the audience to fill in the details from their own beliefs. That would certainly explain the divided reactions the movie is getting. Roger Ebert (raised Catholic) loved the movie, yet he calls “perfectly valid” the criticisms raised by David Ansen (who appears to be a nonbeliever). In the end, The Passion is a new take on an old story. It’s told by an action-movie star-turned director. Maybe you’ll like it, and maybe you won’t.